Preheat oven to 375 F. Coat a 24-cup mini muffin tin with nonstick spray. Set aside. Bring a large pot of water to boil; throw in a pinch of salt and add your pasta shells. Cook until al dente, according to package directions, about 12 minutes. Drain, rinse under cold water, and coat with a bit of olive oil to prevent sticking. In a large bowl, stir together the ricotta, egg, 1/4 cup of the Parmesan, salt, pepper, and nutmeg. Add in the spinach; mix until combined. 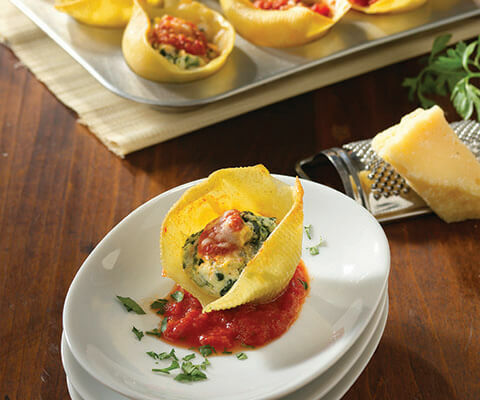 Fill each cooked shell with a heaping tablespoon of the ricotta mixture. Place a stuffed shell into each muffin tin slot. Top with a dollop of Classico® Riserva pasta sauce and sprinkle the remaining Parmesan over each one. Bake for 20 minutes until mixture is warmed through and cheese has melted. Garnish with the parsley. Serve immediately and enjoy! I mean, I understand the concept of "plating" but come on... this is incredibly depressing. No, FILL THE SHELL. Then top it with the remaining sauce and you will not disappoint your guests. I understand that the sponsor is Classico, don't you think that you could write out the receipes instead of using a portion of your product.